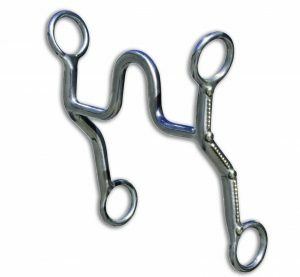 A snaffle bit is a great educational tool and makes learning easy for a young horse. Last time we discussed the many different types of snaffle bits and how they work. With any bit it is important to remember that it is the rider’s hands and not the bit that is most important. A snaffle bit is a great training tool as you can be more specific with your rein aids or cues with the reins than you can when the horse is in a hackamore or a bridle. As the snaffle works right to left rather than vertically, it is good when working on lateral flexion such as the side pass and leg yield. 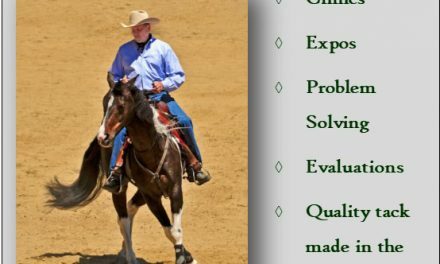 Before your horse goes into a bridle from a snaffle he should know how to stop, do a turn on the haunches, a turn one the forehand, a leg yield, be able to pick up a correct lead, and do flying lead changes (not usually difficult once the horse knows the fundamentals.). In other words, your horse should be able to do all the basics before you even think about going into a bridle. If you are going into a bridle because you are having control problems, you are making the wrong move. 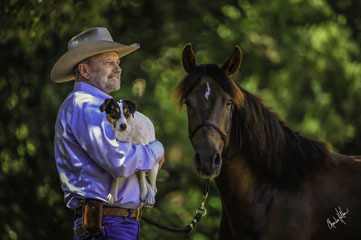 A control problem means the horse is fighting your hands, arguing with you, resisting by pulling or running through your hands, and doesn’t stop when you ask. The horse continually picks up speed when you ask for a trot or a relaxed canter or, the horse tosses his head when you attempt to have him back or do lateral work. It is not good to go into a bridle until you have total control of your horse. Work through these issues before you attempt a transition to a bridle. So, why do we even go into a bridle? I think it is a good, natural progression for a horse’s training, like a child going from elementary to high school and onto college, graduating after they have learned the basics. Also, from my years of experience, I believe that most horses are more comfortable in a bridle. A bridle works from front to rear with different pull and pressures points. When you pull back on the reins, depending on how high the perch is (the upper ring of the bridle), you set the pull pressure. With a bridle, you put pressure on the bars of the horse’s month. You also have a chin or curb strap that, depending on how tight you fasten it, creates a degree of pressure and leverage. A leverage bit also puts pressure on the pallet, depending on the height of the port on the bit. What’s neat about a leverage bit is that it has good tongue relief, which I think is very important. Most horses are more comfortable with tongue relief. A snaffle bit actually puts more pressure on the tongue as it bends and it is harder to give the horse relief. I like a slight relief because I use the tongue to help motivate the horse to yield to the bit. With a snaffle bit, I want the horse to feel pressure at the corners of the mouth, then the tongue and finally the bars of the mouth. Most bridles work from front to rear but there are bridles that work laterally. They are jointed on the side to give flexibility. Sometimes when I ask that clinic participants bring a snaffle bit, they bring a leverage bit with a snaffle mouthpiece. This type of equipment is still considered a leverage bit. The transition from a snaffle to a bridle is important. The old traditional Spanish Vacarro way was to put the horse in a hackamore and then into a bridle. The horse packs the bridle while you work mostly off the hackamore. This allows the horse to feel the change in configuration. It takes time for a horse to feel the leverage. This method works well but it is time consuming. Another way is to change the horse to a bit, starting with a grazing type bit with a low port, an easy action type bit that has tongue relief and is not aggressive. I like to use a leather curb strap rather than a chain in the beginning, as there is less bite and an easier progression. Begin by working on having the horse give to the pressure, lateral flexion, and moving the horse forward. If you have done a good job with basics using the snaffle bit, there shouldn’t be any problem riding the horse in a bridle. The horse should know to stop off your seat cue and move off your leg pressure. 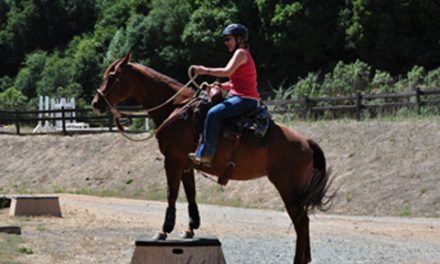 To turn right, add a little outside rein and your leg and the horse should be moving. It takes time to make a good transition. Do not try to do it in one or two sessions. Give the horse an opportunity to feel and change. Some horses go right into it like a broken-in shoe but other horses need more time. I like to start my horses with what I call a correction bit. It is jointed and loose, very similar to a snaffle bit it has more flexibility. Sometimes I use a broken mouthpiece with leverage because the horse is used to the feel and the action. During the transition, I find out which type of mouthpiece the horse likes best. Using a snaffle, it may take you two years or four years to get your horse nicely broken and under enough control to go into a bridle. 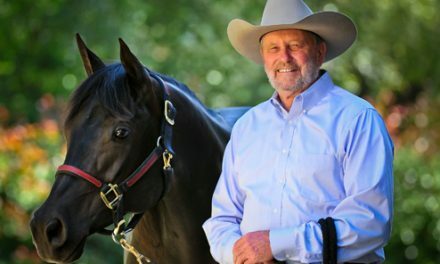 Depending on how quickly the horse learns, how compliant the horse is, and how solid the basics have been taught, the transition from a snaffle to a bridle could take six months to a year without using a hackamore. A hackamore is a great way to go but most people do not have the time. After being in a snaffle, it takes eight or nine months in a hackamore dropping down to a smaller hackamore and then finally into a bridle. The most important thing to remember is that we do not put a horse into a leverage bit to teach it anything. We use a leverage bit for refinement only. Your cues and your rein aids are quiet and relaxed. Your hands in the front of the saddle are almost like a toggle switch, in other words, there is a minimum amount of movement. Being a cowboy, I like riding one-handed. There is a real art to riding one-handed. I feel very comfortable saying that most of the time when I transition a horse into a bridle it doesn’t take too long because I have done a great deal of preparation and the horse in ready to graduate.